^ Born on 15 January 1793: Ferdinand Georg Waldmüller, Austrian painter who died on 23 August 1865. He was one of the most representative Biedermeier painters, together with Franz Kr�ger [10 Sep 1797 – 21 Jan 1857], Georg Friedrich Kersting [22 Oct 1785 – 01 Jul 1847], Julius Oldach [17 Feb 1804 – 19 Feb 1830], Friedrich von Amerling, and especially Carl Spitzweg [05 Feb 1808 – 23 Sep 1885]. The Biedermeier period in art was a transition between Neoclassicism and Romanticism as it was interpreted by the bourgeoisie, particularly in Germany, Austria, northern Italy, and the Scandinavian countries. Following the Napoleonic wars, the Biedermeier style grew during a period of economic impoverishment from 1825 to 1835. The name Biedermeier was derogatory because it was based on the caricature Papa Gottlieb Biedermaier, a comic symbol of middle-class comfort, the unsophisticated imaginary author of poems published by Ludwig Eichrodt[02 Feb 1827 – 02 Feb 1892] in the Viennese satirical magazine Fliegende Blätter , the final spelling being established when Eichrodt published Biedermeier's Liederlust (1869). Such comfort emphasized family life and private activities. Soirées perpetuated the rising middle class's cultural interests in books, writing, dance, and poetry readings, all subject matter for Biedermeier painting, which was either genre or historical and most often sentimentally treated. — Waldmüller received sporadic art lessons of varying quality in Vienna between 1807 and 1820, first under Zinther and then with Johann Baptist Lampi, Hubert Maurer [1738�1818], Josef Lange [1751�1831] and Wilhelm Johann Nepomuk Sch�dlberger [1799�1853] at the Akademie der Bildenden K�nste. After 1811 he made a meager living painting miniatures and giving art lessons. Perhaps more significant than this haphazard formal training was Waldm�ller�s extensive copying after the Old Masters at the court and municipal art galleries of Vienna, mostly between 1817 and 1821. His copy of Jusepe de Ribera�s Martyrdom of Saint Andrew (1821) is an example of his accomplished technique. However, commissions for copies barely enabled him to support himself. — This eminent representative of early realism financed his sporadic studies at the Vienna Academy between 1807 and 1811 by "illuminating chocolate boxes". (Subsequently he made a living as a painter of miniature portraits, as a drawing master and as a scene painter at various theatres.) He gained proficiency in painting in oils, inter alia, by copying the masters of the Italian Renaissance and Baroque as well as the 17th-century Dutch masters. Waldm�ller, who had become professor and first custodian of the picture gallery of the Vienna Academy in 1829, was appointed "Kaiserlicher Rat" (imperial ... rat ... no! ... councilor) in 1835. 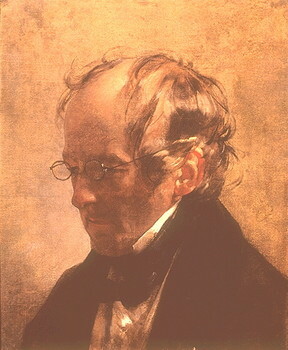 In 1846, he issued his first polemic pamphlet against the instruction provided by the Academy. Metternich supported him for years, but on the appearance of his third pamphlet in 1857, he was sent into retirement and as a punishment his salary was cut by half. In 1863, the pugnacious art historian and pioneer of Austrian open-air painting was rehabilitated by Emperor Franz Joseph I. The independent spirit of the portrait, landscape, genre and still-life painter and his passionate aspiration to "truth" manifested themselves, inter alia, in the unmistakably objective depiction of details and in his unique way of "painting with light".  He studied at the Vienna Academy. He lived in Pozsony, then worked as a teacher of art in the house of Count Gyulay. After his return to Vienna, he copied pictures of old masters, and painted portraits and genre pictures. He became the most significant representative of biedermeier: he was second to none in depicting nature in delicate colors. In addition to portraits, his genre-pictures are significant: Midsummer Day (1844), Grandpa's Birthday (1845), Distraint (1847), Recruit Saying Farewell (1858), Godmother Saying Good-Bye, Neigbors (1859), Congratulators (1861), Going to Church in Spring, Bride Saying Good-Bye (1863), Christmas in a Peasant Room (1849), Returning Home from Church Festival and Panorama. He became a teacher of the Vienna Academy. After he had published his works on art education, he was forced to retire. He was reinstated in 1863. — Waldmüller's students included J�zsef Borsos I, B�la Klimkovics, Viktor Madar�sz, Bertalan Sz�kely, Mih�ly Zichy. — Ruins of the Juno Lacinia Temple at Agrigento (1845, 31x39cm; 992x1250pix, 325kb _ ZOOM to 1983x2500pix, 1323kb; or you can get the same dimensions as this last one, but in a 2002kb version) _ The picturesque ruins of the Temple of Juno Lacinia lie on a rocky hill with an olive grove. In 1845 Waldmüller travelled to Sicily for the second time, on this occasion to Agrigento named after the sacred sites built there in the fifth century BC. The Greek Temple of Lacinia is one such site the Romans dedicated to the goddess Juno Lacinia. For his picture Waldmüller chose the perspective from the north. In the background, to the south, appears the sea between the rock formations. The view of the temple is from its best preserved side. The painting is a direct expression of the fascination the southern light and the characteristics of the Italian landscape held for Waldmüller. The glistening sun bathes the landscape in a warm, yellow light. The color blends the porous stone of the temple with the surroundings, making it seem an integral part of the landscape. The long shadows of a late summer afternoon weave the olive trees spread loosely across the slope into a lattice reaching to the foot of the hill. — The future emperor Franz Joseph, age 2 (1832, 35x29cm; 1250x984pix, 285kb _ ZOOM to 2500x1969pix, 1066kb, or, if this last one dowloads too fast for you, try this, same dimensions, but 5513kb) _ Franz Joseph [18 Aug 1830 — 21 Nov 1916] at the age of two is shown dressed as a grenadier wearing a bearskin cap. In his right hand he holds a rifle and in his left the wooden figure of a Hungarian grenadier. A red and white checked flag used as a marker during maneuvers and a drum complete the military toys. With a friendly smile, the child is seen toying with the insignias of future power. The peaceful ambience and the pseudo still-life arrangement robs the toys of any association with the brutalities of real life. As, later in life, the Emperor was presented with this childhood portrait, he recognized the study of his grandfather, Emperor Franz I [12 Feb 1768 – 02 Mar 1835], in the imperial house in Baden. On the desk in the background stand miniatures of his uncle Archduke Ludwig [1784–1864] and Elisabeth, Princess of Savoy-Carignan [1800–1856]. — Kinder im Fenster (1853, 85x69cm) _ This picture, similar to the preceding one, shows chubby-cheeked, happy children in their Sunday best crowded at the window, watching with interest what is going on outside. With friendly smiles, the smaller of the two boys and the sister follow the movement of their brother's arm as he points out of the picture with his index finger. This gesture, which appears spontaneous and perfectly natural, emphasises the highly illusionist depiction and the implied closeness to the beholder. Waldm�ller captured an unspectacular, fleeting moment with convincing intensity and true-to-life accuracy. The dazzling sunlight and the bold, cast shadows clash almost tangibly. The artist, who referred to the "...three-dimensional reproduction of shadow and light as the point of main interest", achieved a convincingly realistic effect with clearly delineated chiaroscuro. The play of light brings out the various textures with impressive clarity. With great attention to detail, Waldm�ller presents the "glory of simplicity". Dainty climbing roses make the scene appear less shabby and mirror the blooming health of the children. Merry peasant children, depicted without any suggestion of social criticism, were a popular motif when this painting was made in 1853. Frame pictures were a classical motif in European art.  Gy�rgy Ga�l (1842, 63x50cm; 760x600pix, 62kb) _ Gy�rgy Ga�l [1783-1855] was a writer, pioneer in collecting Hungarian folktales. He worked in Vienna. — Caspar Netscher was a son of the German sculptor Johann Netscher. As a young man he went to Arnhem to do an apprenticeship with the painter Hendrik Coster. About 1654 the young artist relocated to Deventer, where he completed his studies in the workshop of Gerard ter Borch. Late in the 1650s, he left for Italy. However, he did not journey further than France, where he married. The couple settled in The Hague. Netscher's early paintings were simple, small-format genre pieces, but in the 1660s he moved onto more distinguished subjects. 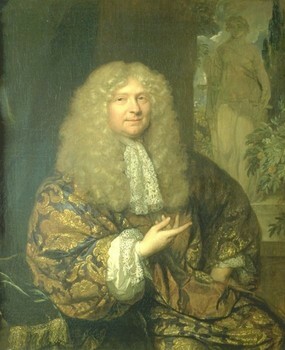 He painted several portraits in the elegant Hague court style. Netscher received high prices for his work, especially in the 1670s, when he developed into a highly successful portrait painter and the enormous demand forced him to employ assistants. Netscher was a master in depicting silk and brocade. His careful rendering of material was derived from the Leiden fijnschilder tradition, but he was also strongly influenced by Delft painters such as De Hooch and Vermeer. In the 1670s he also turned his hand to history pieces and landscapes. In addition to his paintings, a large number of his drawings are still extant. — Caspar Netscher's father was the German sculptor Johann Netscher [–1641] and his mother the daughter of Vetter, Mayor of Heidelberg. At an early age Caspar came to Arnhem, where he was apprenticed to Hendrik Coster, a little-known still-life and portrait painter (fl 1638�59). 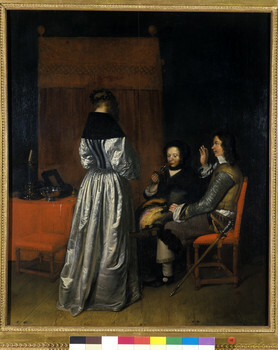 About 1654 Netscher moved to Deventer, where he completed his training in the workshop of Gerard ter Borch (ii). 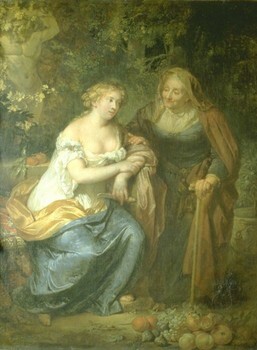 A number of signed and, occasionally, dated copies by Netscher after ter Borch survive from this period, such as the copy (1655; Gotha, Schloss Friedenstein) after ter Borch�s Parental Admonition (c. 1654; Amsterdam, Rijksmus.) and a freely handled version (1659; untraced) of ter Borch�s Doctor�s Visit (1635; Berlin, Gem�ldegal.). Netscher�s first independent compositions, for example the small pendants Portrait of a Man and Portrait of a Woman (both 1656; Utrecht, Cent. Mus. ), were strongly influenced by ter Borch. That these works are all fully signed suggests that Netscher held a special position in his master�s workshop. — The students of Caspar Netscher included, besides his sons, Johannes Brande, Olivier Deuren [1666-1714], Jacob Does the Younger [1654-1699], Daniel Haringh [1636-1713], Maurice Linden, J. Spirk, Johannes Tiellius [1660-1719], Johannes Vollevens the Elder [1649-1728] Aleijda Wolfsen [1648-1690].  Mary II, Wife of Prince William III (80x63cm) _ Cloaked in an orange dress Mary sits against a background that includes a giant amphora. A balustrade separates the terrace from the luscious growth of the garden with its various statues. The ermine cloak indicates the subject to be royalty: Mary II was the daughter of the English king, James II. On 15 November 1677, Mary, still only sixteen, married the Dutch Stadholder, William III. The couple took up residence in Holland. In 1689, she and William were crowned King and Queen of England and Scotland. Her father, James II, a Catholic, had aroused the opposition of the English Protestants who subsequently invited William III to usurp the throne. The royal monogram on the tapestry is that of William and Mary: Rex William et Maria Regina. The interwoven initials 'W' and 'M' symbolise the marital bond between William and Mary. The tapestry was made between their accession to the throne in 1689 and Mary's death in 1694. Beneath the crown are the coats of arms of Scotland, England and Ireland and the lion of Nassau. This tapestry was probably made after a design by Daniel Marot, one of the leading artists in William and Mary's court.  William III, Prince of Orange and, from 1689, King of England (80x63cm) _ While a cavalry skirmish rages in the background, William III poses coquettishly with one hand on his hip and holding his staff of office in his other hand. He is wearing armour. His helmet, decorated with an orange plume, is standing on a block of stone. William III was the first member of the House of Orange to bear the title king. In 1689 he became King of England. That was after this portrait was painted, in which he is depicted as captain general of the army - the position he was appointed to at the beginning of 1672. Later in July of that Disaster Year he was installed as Stadholder, thus ending the first Stadholderless Period which had begun in 1650, the year of the death of William II [27 May 1626 – 06 Nov 1650] and of the birth of William III [14 Nov 1650 – 19 Mar 1702]. A stadholder (the word means viceroy or governor) represented the sovereign in a part of the latter's domain. He was both administrator and general. When the provinces of the Low Countries revolted against Spain in the late 16th century the office was retained. But now it was the provinces themselves that appointed the stadholder. Each province had its own stadholder, although the same person was often appointed in more than one province. of Holland and Zeeland. A series of bitter conflicts with Stadholder William II led the province of Holland to oppose the appointment of a successor after the latter's death in 1650. Holland gained its objective. The States General resolved that it was not constitutionally necessary for a province to appoint a stadholder. No successor was therefore chosen. Friesland and Groningen kept their own stadholder. The first Stadholderless Period lasted until 1672, the Disaster Year in which England and France attacked the Republic together. The call for a strong leader became irresistible and a new stadholder had to be appointed. William III was the son of William II and Mary Henrietta Stuart [14 Nov 1631 – 03 Jan 1661], eldest daughter of the English King Charles I [29 Nov 1600 – 09 Feb 1649]. William III also married (on 15 November 1677) an English princess: his cousin Mary II [30 Apr 1662 – 28 Dec 1694], daughter of the future King James II [24 Oct 1633 – 16 Sep 1701]. It was in 1685 that James succeeded to the throne of England. However, he soon began to rouse the opposition of the English Protestants with his pro-Catholic policies. Eventually, the King's opponents called on William III and Mary II (next in line) to take the English crown. Having gained the permission of the States General States General, William III left for England on 11 November 1688. In Bruges in 1464, representatives of the estates of the various provinces of the Netherlands assembled for the first time at the invitation of Philip the Good under the name States General. A century later, during the Dutch Revolt against the Spanish king, the States General assumed sovereign power. Under the Dutch Republic (1588-1795) the States General represented the central authority. The delegates of the seven provinces met in the Binnenhof in The Hague. Today, the States General is the name given to the combined upper and lower houses of the Dutch parliament. With a fleet of three hundred ships, William sailed from Hellevoetsluis. On 15 November 1688 the Stadholder and his army landed at Torbay, starting the “Glorious Revolution”, which passed without bloodshed, as most of the English forces deserted to William's camp, and ended in early 1689, when William and Mary accepted to be joint monarchs under the condition set by the English Parliament that they accept the Bill of Rights, a new limitation on the power of the crown.  The Lace-Maker (1662, 33x27cm) _ Caspar Netscher is said to have been born in Prague but moved as a child to Arnhem, where he was a student of the local painter Herman Coster before entering the studio of Gerard ter Borch in Deventer. (The central figure in ter Borch's An Officer Dictating a Letter has been identified as Netscher.) He set out for Italy but only got as far as Bordeaux where he stayed for several years before returning to Holland in 1662 and settling in The Hague. He established a great contemporary reputation, . particularly as a portrait painter, and is said to have been invited to England by Charles II. He declined to go, although he painted many English and French sitters in The Hague. His portraits, most of which are on a small scale, were strongly influenced in style by van Dyck and his followers. 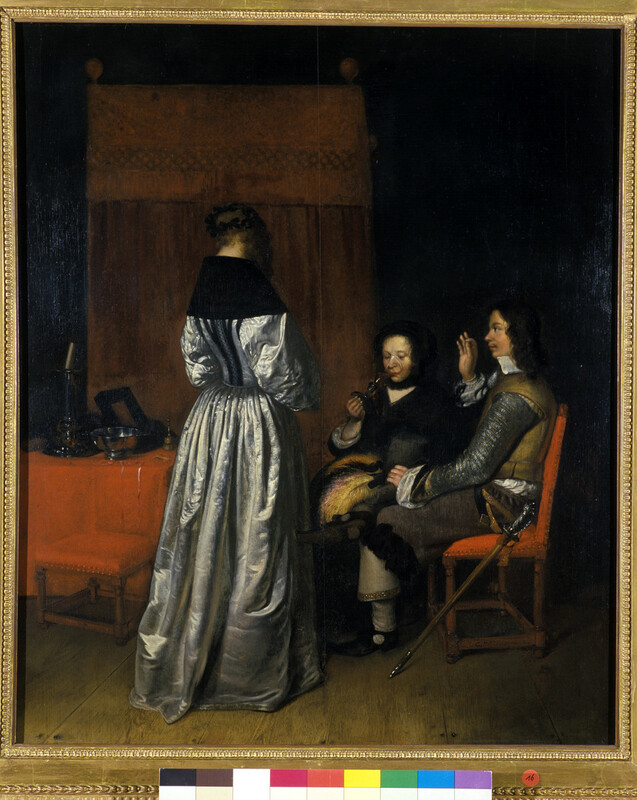 In his early years, before devoting himself exclusively to portraiture, Netscher painted small-scale genre paintings and also some religious and classical subjects: the earlier ones are related stylistically to the work of ter Borch and Metsu, the later ones, to Frans van Mieris the Elder. This painting was cleaned in 1990 and the correct date of 1662 revealed. It stands, therefore, at the very beginning of Netscher's career as an independent artist in The Hague. It is one of his most successful works, remarkable for the modesty of its subject, its richness of color and firmness of modeling. It is an image which celebrates the effective performance of quiet domestic duties. 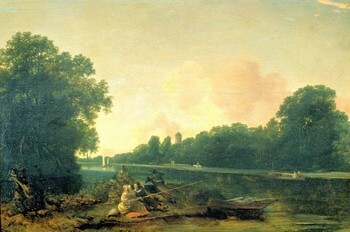 The landscape print pinned to the wall (at the bottom of which can be seen the artist's signature and the picture's date) shows how such works were displayed in households which were not prosperous enough to afford paintings.  Presentation of the Medallion (1655, 62x68cm) _ A young officer kneels to present a medallion to a young woman sitting by a table. She receives his attentions with no show of emotion, unlike the woman behind her and the young man beside her who are preparing to drink a toast. A feature of this work is the splendid painting of the elaborate costumes worn by the protagonists. It is not possible, nor is it important, to decide whether the officer is making a declaration of love or merely handing over the medallion on behalf of some absent friend. Netscher became a student of Terborch sometime during the 1650s and he was the student who most successfully emulated the style of his master. As a young man he made excellent copies of Terborch's works. It has been suspected that the Presentation of the Medallion is an adaptation of a painting by Terborch. Although it is typical of the best of Netscher's work, the somewhat affected gesture foreshadows the approach of the later more mannered period of genre painting. ^ Died on 15 January 1887: Friedrich von Amerling, Austrian painter born on 14 April 1803. Like Waldmüller, he is considered to be one of the Biedermeier painters. — He came from a family of craftsmen and studied (1815�1824) at the Akademie der bildenden K�nste, Vienna, where one of his teachers was the conservative history painter Hubert Maurer [1738�1818]. From 1824 to 1826 he attended the Academy in Prague, where he was taught by Josef Bergler II [01 May 1753 – 25 Jun 1829]. In 1827 and 1828 Amerling stayed in London, and he met the portrait painter Sir Thomas Lawrence [13 Apr 1769 – 07 Jan 1830], whose work was to be a strong influence on Amerling�s painting during the next two decades. Amerling also went to Paris and Rome but was recalled to Vienna on an official commission to paint a life-size portrait of the emperor Francis I of Austria. With this work, Amerling became the most sought-after portrait painter in Vienna, a position he was to retain for about 15 years. — Princess Marie Franziska of Liechtenstein, at age 2 (1836, 33x27cm; 1250x1010pix, 250kb _ ZOOM to 2500x2020pix, 1084kb; or you can get the same dimensions as this last one, but in a 6210kb version) _ The mamy is shown sleeping with a doll in her arms. Her relaxed and peaceful slumber mirrors her untroubled being. The finely painted features and red cheeks contrast with the energetic, open brush strokes, which capture her unruly locks and wrinkled shirt. Amerling focuses closely on the subject, thereby increasing the intimate nature of the picture through its proximity to the viewer. This work is a successful blend of portrait and genre. As seen here, this combination played a dominant role in the Biedermeier period. This portrait also expresses the close relationship between the artist and his princely client. 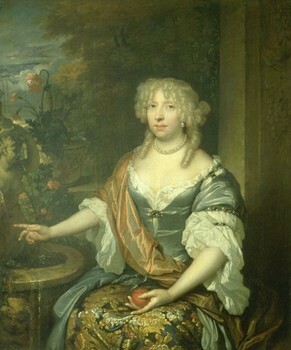 Prince Alois II commissioned many portraits of his family from Amerling. This painting is the first of a series, comprising portraits of the Princesses Karoline (1837) and Sophie (around 1839), the hereditary Prince Johann (1845) and finally of the Prince himself, in a robe of the Order of the Golden Fleece (1845). — The Sculptor Bertel Thorvaldsen (1843, 103x81cm; 1250x992pix, 154kb _ ZOOM to 2500x1985pix, 770kb; or you can get the same dimensions as this last one, but in a 4573kb version) _ Thorvaldsen [19 Nov 1770 – 24 Mar 1844] is shown sitting comfortably in an armchair with a look of concentration on his face. The marked wrinkles between his eyes and the thin-lipped mouth, seemingly incapable of smiling, bring to life his taciturn and melancholy personality. This portrait was painted during Amerling�s second stay in Rome. Presumably the main features of the work were complete by autumn 1842, as Thorvaldsen, who left Rome on 01 October 1842, etched his name into the wet paint with the wooden tip of a brush. Amerling�s signature below indicates that work on the painting continued until 1843. Thorvaldsen�s fame had not diminished with age. He briefly returned to Rome in 1841, where he had worked for almost forty years, developing his sculptural style with its influences of classicism and emerging romanticism. ^ 1909 Robert Zünd, Lucerne Swiss painter born on 03 May 1827. He was trained by Jakob Schwegler [1793�1866] and Joseph Zelger [1812�1885], whom he accompanied on a study visit to the Engadine. Zelger encouraged him to go to Geneva in 1848. There he was a student first of Fran�ois Diday and then of Alexandre Calame, who influenced his early work. However, while Calame painted dramatic mountain scenes, Z�nd preferred the idyllic, tranquil region of the Alpine foothills. In 1851 he moved to Munich, where he met the Swiss painter Rudolf Koller, who remained a close friend. From 1852 he often stayed in Paris. He studied paintings by 17th-century Dutch and French artists in the Louvre and became acquainted with Alexandre-Gabriel Decamps, Louis Fran�ais, Louis Cabat, Frank Buchser, and Albert Anker. �- Der Lauerzersee (668x900pix, 52kb) some crackling in the sky. ^ 1926 Eugeniusz (or Eugen) Zak, Polish artist born on 15 December 1884. 1868 Lucie-Marie Mandix Ingemann, Danish artist born on 13 (19?) February 1792. — Portrait of Ingemann by Andreas Ludvig Koop (1822; 1136x830pix, 325kb) monochrome brown, faded..
^ 1845 John Knox, Scottish artist born in 1778. — Relative? of Archibald Knox [British, 1864-1933]? ^ 1743 Jan Kaspar Hirschely, Prague Czech still life painter born in 1698 (1695?). He was a student of Johann Adalbert Angermeyer.  Mountain scenery (1670, 53x69cm) _ a memory from Esselens's stay in Scotland. _ Titled aka Tort Trot (920x1300pix, 709kb). As you may have noticed, Fihler would never stoop to naming a picture Untitled, but prefers to give them names as meaningless as possible, palindromic when the picture is symmetrical..
_ Knock the Stamp or Stamp the Knock (2006; screen filling, 286kb _ ZOOM to 1000x1414pix, 739kb). 1858 Giovanni Segantini, Italian painter who died (full coverage) on 28 September 1899. �- Good News! (80x101cm; 629x799pix, 50kb) _ .detail (780x540pix, 79kb _ .ZOOM to 1170x810pix, 83kb) 3 children. 1737 Johann Josef Karl Henrici, German artist who died on 27 October 1823. �- People in a Kitchen (45x56cm; 716x900pix, 53kb) very dark, in this one the artist is underserving of being called “le Clair”. ^ 15 January 1899 The Man with a Hoe, poem by a US schoolteacher, Charles Edward Anson Markham (1852-1940), who used the penname Edwin Markham, is published. It was inspired by a 1863 painting: L'homme � la houe by Jean-Fran�ois Millet [04 Oct 1814 20 Jan 1875]. The poem quickly became as famous as the painting. Both continue to be moving testimonies to what the too prevalent inhumanity of humanity can cause.